How do you Grill a Better Burger? Isn’t it about time to try? Not only for Holidays, but for any day of the year. Restaurants are now charging upwards of $15 for a decent Grilled Burger. You can make juicy and delicious Burgers at home for a fraction of the price. Most importantly, you’ll really get to “Have it your way.” For parties, it is even better nowadays to allow Guests choices for the Paleo Diet, Vegetarian and Gluten Free options, as well as fluffy Brioche buns. Some creative additions of Fruits and Vegetables to the Menu will be appreciated by Diabetics and others who are trying to eat healthier. These were inspired by a big event I catered for the Employees of the Santa Monica Police Department. So Labor Day is the perfect time to share them. I own the noteworthy distinction of having one of my BBQ Burger dishes described as “Too Healthy” and “UnAmerican” by Food Network Judge Simon Majumdar, right before I was named the first Cutthroat Kitchen Grilling Champion. [The dish was a Smoked BBQ Cheeseburger with Grilled Broccolini]. For over 2 years, I had been distributing a Gluten Free, All-Natural Herb and Spice Rub. It is a delicious blend of internationally recognized Superfoods (like Smoked Paprika, Garlic, Onion and Turmeric, etc…), with No Added Salt, Sugar or Preservatives. The blend is called HEROIC! by California Gold BBQ Rubs. Fortunately, more and more people are starting to find it on Amazon.com. Just so you know, the event was the Santa Monica Police Department’s 120th Anniversary “Birthday” Party. They were expecting up to 500 people! Fortunately, Kingsford contributed plenty of bags of Professional Charcoal. The Pit Barrel Cooker Co. pitched in new Grills for us to use (plus extras to give the Police Dept.). Many of the Celebrants were into fitness, and had their Hot Links, Burgers and/or Chicken Breast “Sandwiches” without the buns. I also learned from the Vegetarian and Gluten Free Guests that they prefer to eat All Natural and don’t want to settle for the engineered Soy based Meat and Dairy substitutes. If you don’t happen to have HEROIC! (or another favorite BBQ Rub) on hand, check out some of these Homemade Rub Recipes. The point of these Recipes is to infuse amazing flavors into your Burgers before adding the Ketchup, Mustard and BBQ Sauce. Also, eat plenty of Fruits and Veggies (Raw or Grilled), for a more balanced BBQ Experience. It is also easy to add Natural Smoke flavor to your Grilling (see link below). For those on Social Media, please share photos of your Super Duper #HEROICBurgers (and #WatermelonFries Pics) with #BBQRESCUES! on Facebook, Twitter, Instagram, Pinterest or Google+. Have a great Holiday. Until next time, Eat and Be Well. 1. Paleo “Diet” Style Burger- Superfood Seasoned Ground Beef with Fresh Grilled Onions. 2. BRIOCHE! SUPERFOOD! DELUXE!- Fresh “Salad” Piled High on top of your Superfood Patty. 3. 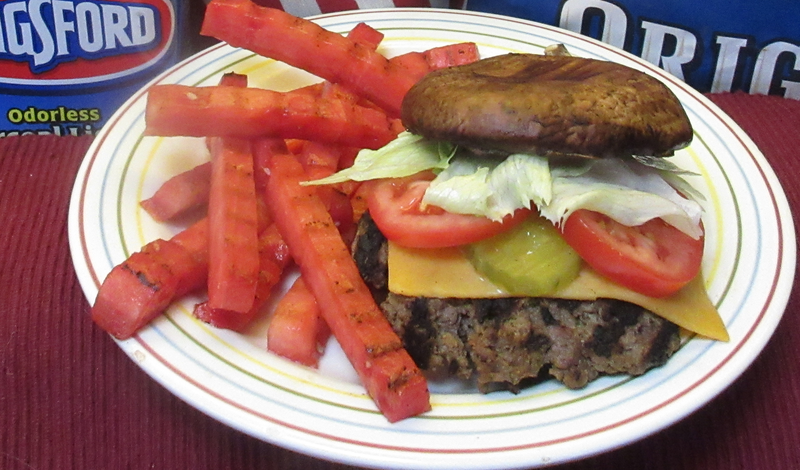 ‘SHROOM BURGER DELIGHT with GRILLED WATERMELON “FRIES”- Use two large Grilled Portobello Mushrooms as the buns. A hint of Pink Himalayan Salt added to Quick Grilled Watermelon “Fries” will take your taste buds into uncharted territory. Heat Grill. Gas or Charcoal- may use Wood Chips/Chunks to add Smoky Flavor. Kingsford Charcoal/ Products Recommended for Reliability. See Article on How to Smoke on Any Grill. Prep Burgers. Combine all Seasonings with Ground Beef and separate into 4 Patties. May use Burger Press for more uniform shapes. Prepare Seasoned Mayo, and slice Onions, Tomatoes and Lettuce for Burgers. Cut Watermelon into 2 inch Slices and remove Rinds to make Rectangular shape. Keep Chilled. Sear Burgers on high, move to low heat for 4-8 Minutes, depending on desired doneness. Melt Cheese for final 3 Minutes. Rub Mushrooms with Olive Oil (to prevent sticking) and Grill 3-5 Minutes/per side (depending on thickness). Do not overcook or will be too mushy. Keep Watermelon chilled until ready to use. Quickly cook 2-3 Minutes/ per side on hot part of Grill for Grill Marks, but should stay crisp. Serve Immediately. May also briefly Grill Buns for the Brioche Superfood Burger. Add desired amount of Potato Chips to aluminum pan (or homemade foil basket), Add BBQ Rub and Smoke for 8-10 Minutes (see video). Posted in BBQ, BBQRescues, RESCUES! & RECIPES, VIDEOSTagged barbecue, bbq, bbq catering, bbq rubs, bbqrescues, California Gold BBQ Rubs, chefmickbrown, Cutthroat Kitchen, Food, grilled vegetables, grilling, grilling veggies, HEROIC Burger, HEROIC! CaliforniaGoldBBQRubs, Holidays, Kingsford Charcoal, mickbrown, mushroomburger, Pit Barrel Cookers, recipes, Santa Monica Police Dept., smoking food, Tastee BQ Grilling Co.